Offering young people a unique creative experience. 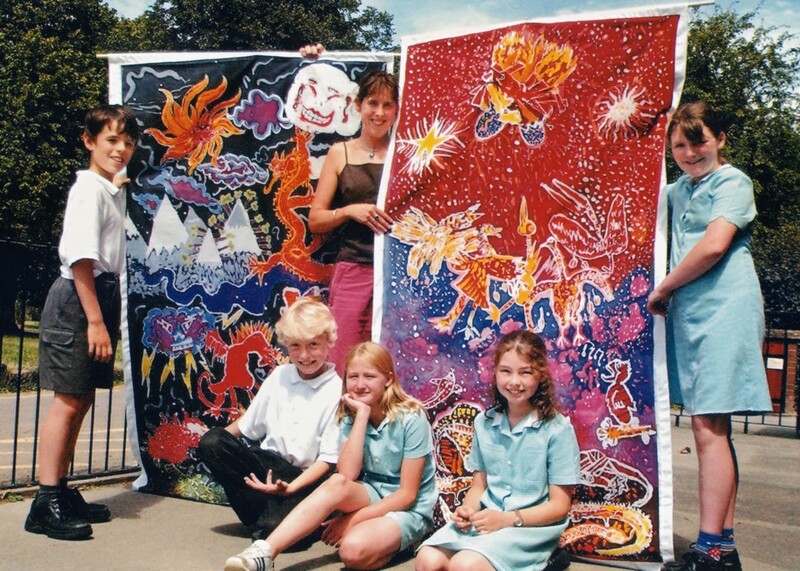 Children at your school can design and produce stunning giant batik paintings. Using the traditional art of Indonesian Batik on the theme of Dragons, Ancient Greeks, Romans, The Great Fire of London, Aesop’s Fables, Creation, life-cycles, India, Africa, or even the schools motto. From the initial design through to the multi-layered painting of wax and dye, students aged between 4 -14 remain involved in this extraordinary medium until the work of art is complete. Always based on a theme, our workshops increase cultural awareness, promote self-esteem and encourage children with a diverse range of needs – and the school is left with an amazing Batik Painting. 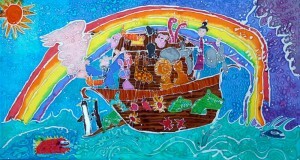 Eekbatik is Sarah and ‘M’ both professional batik artists specialising in art workshops in schools. Working as a duo they offer dynamic exciting art workshops creating giant batik paintings in a creative learning environment. Eekbatik have been running workshops in schools and community centres since 2003. It only takes ONE DAY to produce a giant batik for the school. These workshops increases cultural awareness through chosen stories and themes. They develop personal creative thought processes and ideas. They promotes self-esteem and small group co-operation. They also include and encourage students with a diverse range of needs. The art workshops give a unique opportunity to work with professional artists in small groups which are positive and very exciting for all involved. Each batik is unique, designed and created by the children. Classes work together collaboratively applying melted wax and water based dyes on to cotton whilst learning about colour, resist, design and texture. reception children at Charlton Kings Infant School, Cheltenham. “What a fantastic experience our 270 children had with our friends from Eekbatik! Each class produced a themed batik which we have hung proudly around our school. Eekbatik have worked with “The Guardian Newspaper” for the Big Draw, “The Ledbury Poetry Festival” over 3 years creating flags to line the streets, and had batiks displayed in the “National Gallery: as part of the Take One initiative. 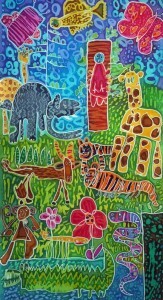 Over 500 giant batiks have already been produced in schools.